A Day in the Cloister: A snapshot of the daily life of the Daughters of Mary, Mother of Our Savior NEW! Divine Office of Matins - Christmas Eve MP3 DOWNLOAD EDITION: Responsories (Acapella) and sung Psalms NEW! 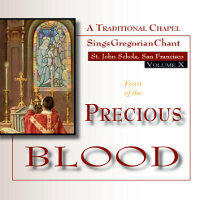 The Feast of the Precious Blood (Vol. 10): Includes Divine Office of Terce and Angelus NEW! From Silence to Light: Gregorian Chant NEW! Gregorian Chant - Requiem: Requiem Mass recording according to the Norbertine liturgy NEW! Gregorian Chant - Christmas Chants: Christmas chant from 7 different choirs NEW! Gregorian Chant - Dominican Liturgy: Rare CD of authentic Chant from the Dominican Rite NEW! Gregorian Chant for Kids: Volume 1: Teach your children Gregorian chant! NEW! Gregorian Chant for Kids: Volume 2: Teach your children Gregorian chant! NEW! Gregorian Chant: The Definitive Collection: Best Hits - The most beautiful chant sung by the Monks NEW! Gregorian Chant: Together on the Way NEW! Set: A Gregorian Christmas and Christmas Eve Matins: Special set price! NEW! 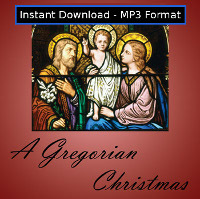 A Gregorian Christmas MP3 DOWNLOAD EDITION: Beautiful chant for the Christmas season NEW! 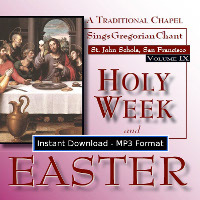 Holy Week and Easter (Volume 9) MP3 DOWNLOAD EDITION: A lay choir sings part of the liturgy for Holy Week and Easter NEW!